Food Photo Friday: Gaga For Food Fashion : The Picture Show A year before Lady Gaga's meat dress made its debut, Ted Sabarese had a similar food fashion fetish. A year before Lady Gaga's meat dress made its debut, Ted Sabarese had pioneered a project of similar food fashion. "Back in late 2008," he writes in an email,"I had been interested in the notion of people's relationship with food. ... I decided to tackle [it] with my photography. The idea behind 'Hunger Pains,' as the series is called, "was to visually suggest an actual meal the model was craving by having them wear it." Sabarese contacted the CEO of SOTU productions to help with his project. In addition to dancing, choreographing, singing and designing, Sabarese explains, SOTU has also been responsible for some of the most outrageous costumes. 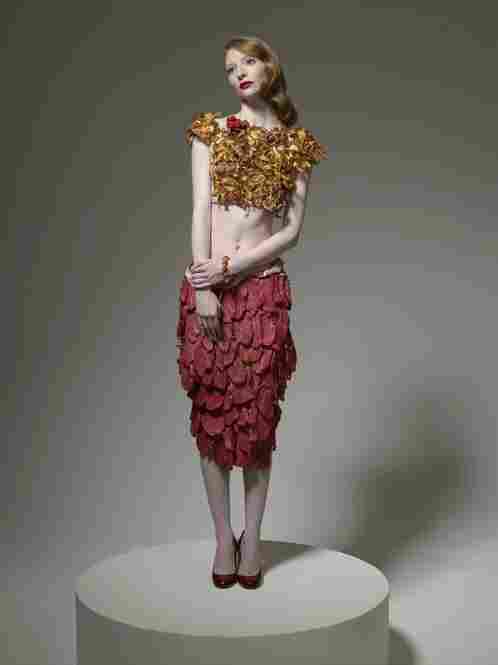 The artichoke dress in this series, for example, took six hours to construct and was designed by Daniel Feld and Wesley Nault of Project Runway. In the words of Tim Gunn, they somehow managed to "make it work." 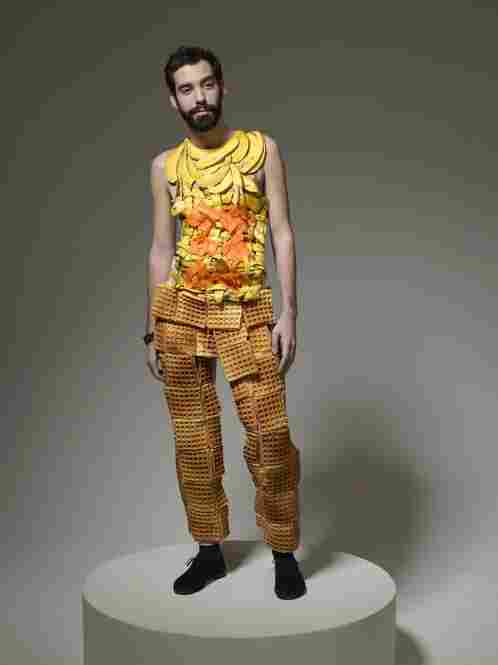 Each model's clothing in the series was made entirely of real food and depicts a meal that the person was craving. The project was shot in January, 2009 (pre Lady Gaga). 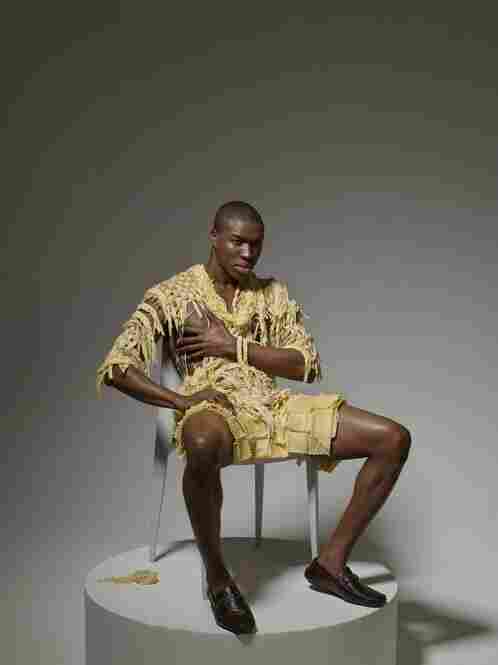 Fifteen designers were involved and each garment took hours to cook, create and assemble. Fifteen designers were involved and each garment took hours to cook, create and assemble. The artichoke gown was designed by Daniel Feld and Wesley Nault of Project Runway fame. It took over 6 hours to finish (the model stood the entire time while they attached each, individual leaf). Watch this behind-the-scenes video. 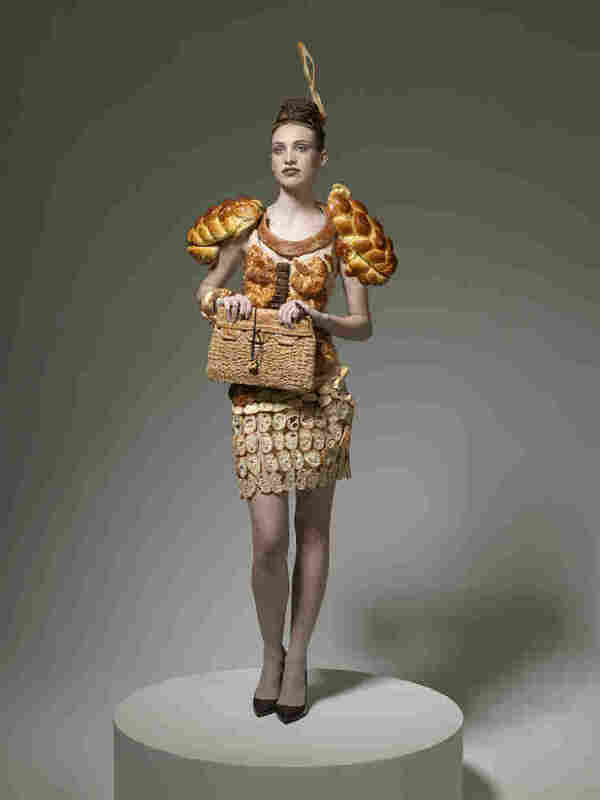 What would your food fashion be?